Ever since we were little, we're constantly told to wash our wands before we eat; but it's not all the time that we get to see a faucet and a sink when we eat. How about when we eat our chips, go out on a picnic how are we supposed to sanitize and clean our hands off of those germs before we use them on our food and into our mouth? Yikes, right?! 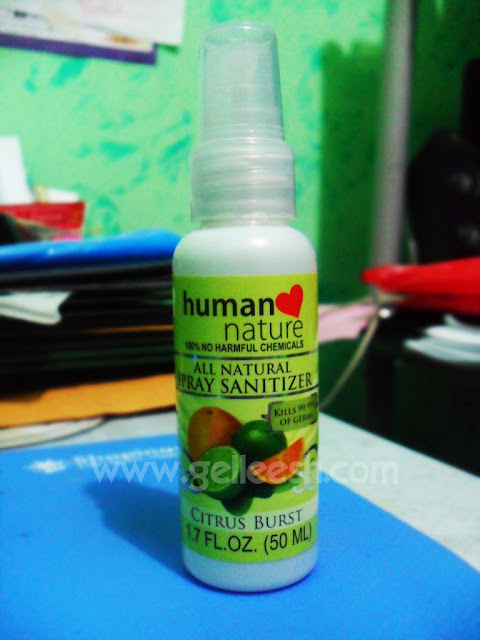 The HumanheartNature All Natural Spray Sanitizer I have comes in Citrus Blast. I love the scent it has because it isn't too strong so good news for your nose! Considering the fact that it is from HumanheartNature, true enough it is 100% no harmful chemicals! I've had other sanitizers and my problem always will be the strong alcohol scent or the super sticky jelly feel it has after application and this one from HumanheartNature doesn't have any of those. I think I found the perfect sanitizer for me. And even though it is a sanitizer, fret not for it does not dry up your skin. yay! didnt know that they have a sanitizer din..
Nice reveiw gellie.. i wanna buy this. I want the citrus smell nakaka relax yun e.